These TALES FROM THE TEACHERS' LOUNGE are for everyone who has ever had the "Monday Morning Blues" and for all whom are desperate to set the world on fire... before their students do it for them! With Book/lyrics by Robin Seidman Pullen and Joyce Puskas, and Music/M Direction by David Reeb, a retiree wannabe discovers her young teaching partner has only taught cats, and her newest student must be Satan's spawn! 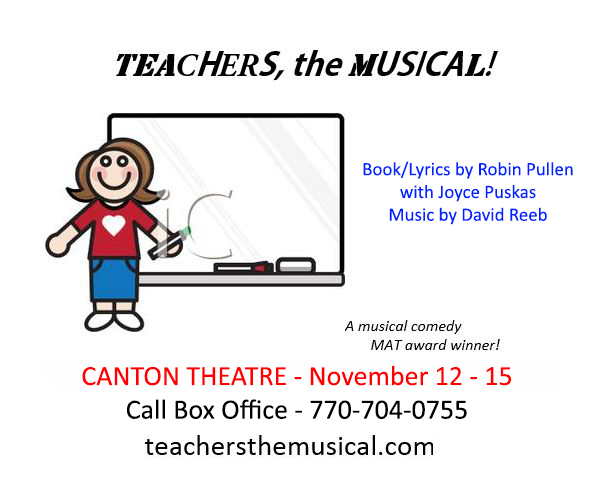 This musical comedy is about "tested" teachers who discover what they have might not be what they want! 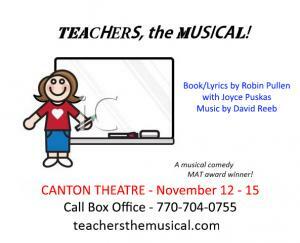 Tickets at teachersthemusical.com and Canton Theatre's Box Office. To purchase tickets at the box office, please call 770 704 0755. Canton Theatre 171 E. Main St.